Which Obstacle Course Race Should I Sign Up For? | JustRunLah! 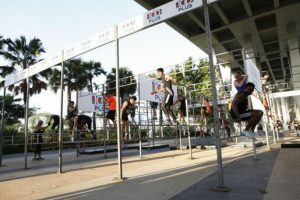 Which Obstacle Course Race Should I Sign Up For? Heard of the Commando Challenge, Men’s Health Urbanathlon, Spartan Race and Viper Challenge but not sure which to start investing your money and training efforts in? Here’s my little comparison between the Commando Challenge, Men’s Health Urbanathlon and Spartan Race. Will update if I get to try a Viper Challenge! This is why some people get shoes specially for obstacle course racing. Your regular running shoes might not be the best for sand/mud/grass/water. 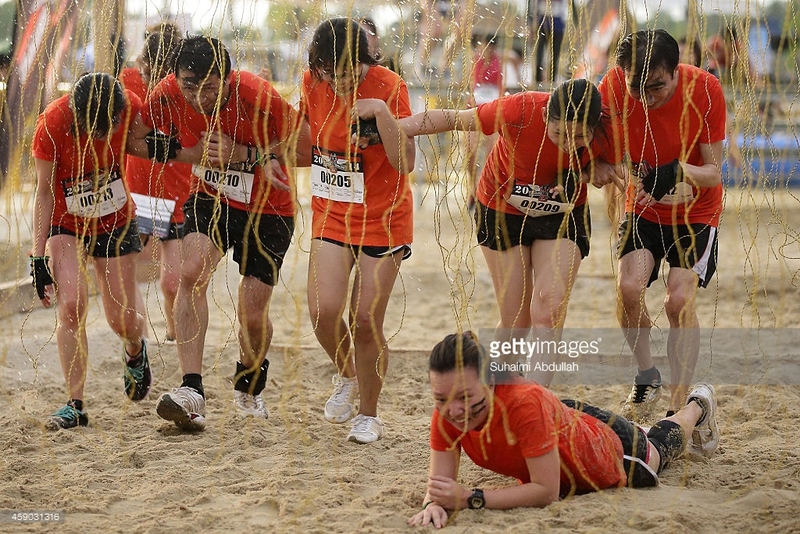 Commando Challenge 2015 (read my separate review of CC2015 here) was held at Sentosa and there was a significant distance we had to cover in sand. Men’s Health Urbanathlon was intended to be in an urban setting, so it’s mostly tarmac, peppered with some grass. Not that different from running-only races. Spartan Race 2016 (I did the Super) was a mix of tarmac, grass and mud. Nowhere as muddy as overseas Spartan Races though. While I found the sandy terrain of Commando Challenge hard to run in, it was the foresty and slope-filled course of Spartan Race that was really challenging for me. Men who have been through the army would probably be like, “it’s just like the SOC (standard obstacle course) right?” Maybe. But looking back to the most memorable obstacles of each race, I find that I remember them for different reasons. Commando Challenge’s last obstacle involved running through curtains of wires, where the slight electric shocks made my muscles twitch weirdly. If they had photographers shooting there, we might have seen some really funny photos. Spartan Race has penalties for not completing obstacles. Each obstacle not attempted or failed earns you 30 burpees. And we’re talking standard Spartan Burpees, which needs your chest to touch the ground before you push yourself up and jump. There are volunteers to keep count for you. It’ll be fair to consider the burpees as obstacles themselves, but to me the highlights were the rope obstacles–the Tyrolean Traverse and the Rope Climb. I attempted but couldn’t complete both, and I really admire those who could because those obstacles required much muscle control, strength and determination. Throughout the course of each race, similar to regular running races, you’ll have bunch of volunteers lining the route cheering you on and directing you to the right turn. 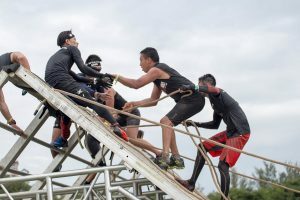 Unique to obstacle course races, and heartwarming, is the human connection between racers. People lend helping hands, legs, shoulders so that others can climb walls, ascent steep slopes and swing over monkey bars. Some are friends who sign up for the race together, some eventually become friends and finish the race together. Having the support from Mediacorp, Spartan Race definitely has the edge in raising awareness for their events. They even had a spread in Today newspaper! 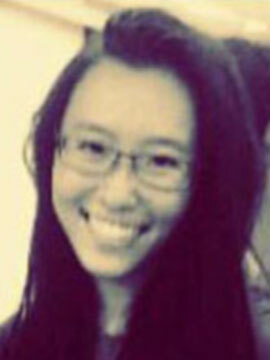 And they also have a Mediacorp team of your favourite actors. Ben Yeo offered his hand to help me cross a wide drain. And unlike Commando Challenge and Urbanathlon which present themselves as a one-off event, Spartan Race has various categories from which you earn fractions of a medal to create a bigger medal. And they’ve also got regular public workouts to build communities. Great way to engage people and nurture followers, I think. And if you’re looking for bountiful race packs, forget it. None of the races above gave more than the minimum. Go for the experience, not the material rewards. Click here for more post from SmallSteph.